You are too late to see the “birds”! 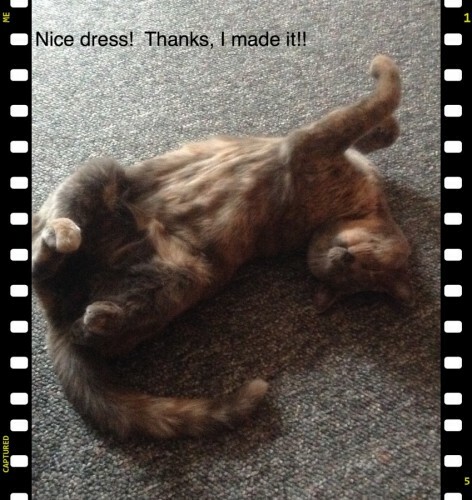 – Nice dress! Thanks, I made it!! You are too late to see the “birds”! 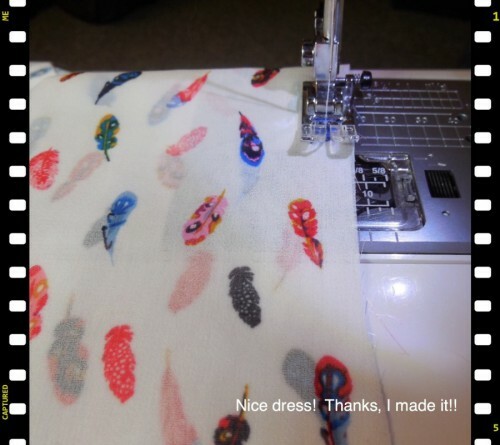 The April challenge for The Monthly Stitch WAS “put a bird on it”! 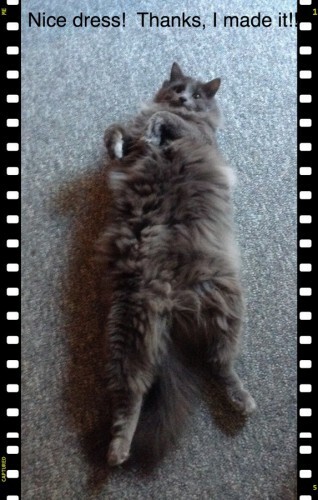 Well it is too late for that now … my cats chased after them and they all flew away – all that’s left is the feathers! Guilty as charged! Just look at them! 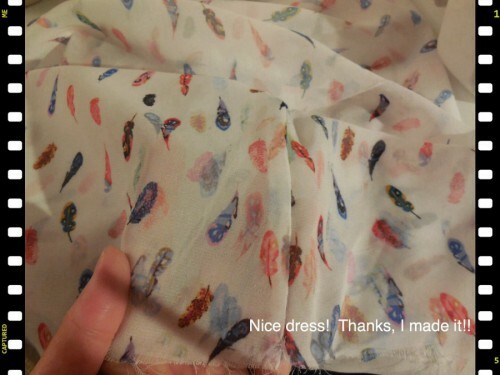 Beginning of April, I purposefully went to my fabric shop to buy fabric with a “bird on it”. Nothing was to be found. 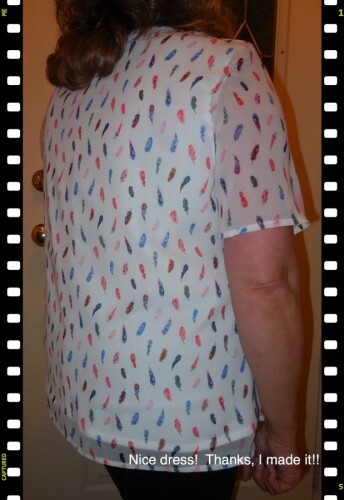 I did, however, find a lovely light polyester chiffon with a colourful feather print. Luckily, I already had a solid white polyester in my stash. 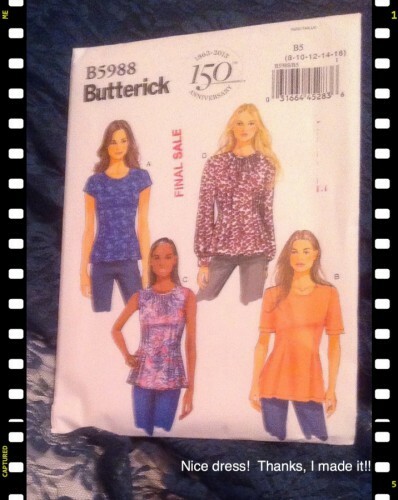 I used my Butterick pattern, B5988, tried ‘n true. It is such a TNT that I left the pattern pieces and instructions in the envelope and just used my traced pieces. Sew the wrong sides together! Fold the seam over, iron, trim, and sew again, sewing the right sides together this time. As an added precaution, I zig zagged the seams too. At the neckline, I sewed together both layers – the see-through chiffon and the solid white polyester. The only other place I attached the two layers was a couple of stitches under both arms. Then I bound the neckline edge with single fold bias tape. Sewing single fold bias tape on the right side. Folding it over the edge and sewing it on the inside. I then realized after flipping and turning and sewing and some more flapping, the edges of my sleeves and hem were fraying. I spent a few days staring at my top trying to decide the best thing to do. I didn’t want a large hem. I would prefer to have no hem at all! Wonder Tape to the rescue! So I trimmed the mess off. I applied the Wonder tape to the wrong side at the very edge, folded the hem up twice and sewed the narrow hem down. The Wonder tape gave my narrow hem some body, but was not stiff at all. Just right! Now I have a lovely white top. This is probably the last time you will see it really white though, after I get through a day wearing it, who knows what colour it will be…. spaghetti sauce anyone? Lovely shot of my big elbow. Lovely shot of my big veined hand. Does anyone else have any hints on sewing polyester chiffon? 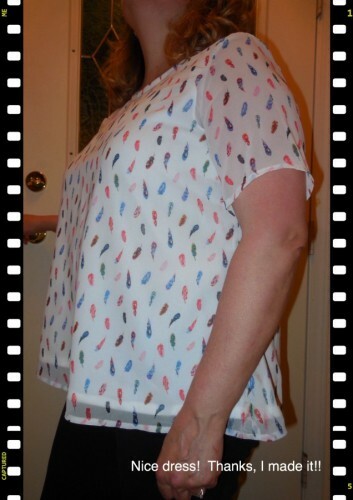 Cute top and what a great solution for the hem! Thanks. I figure even if the Wonder tape inside wears off or washes out, I already have the sewing neatly in place! Lovely top. 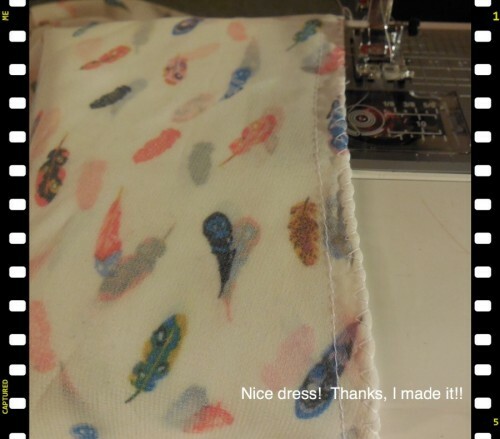 I hate sewing chiffon, but have been known to dunk it in a gelatin solution to give it body. This works a treat. BTW I thought of you yesterday because someone said “nice dress” and I said “thanks I made it”!! Isn’t it nice to be that time of year when we can start wearing the brighter fun colours? No more grey. 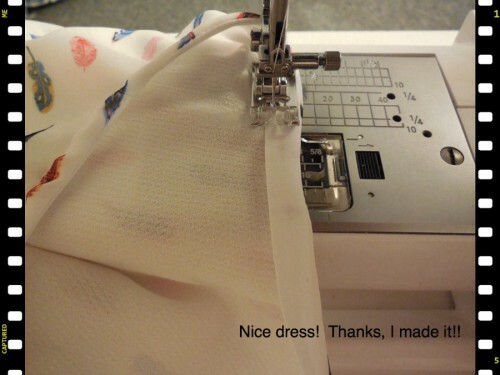 I have no idea how to sew polyester chiffon, but your blouse looks lovely. Thank you! I am happy for our weather… And thank you for reading and commenting! Thanks for the tips. Actually this is the first time for me. As usual I just had an idea and ran with it, doing the research afterwards! 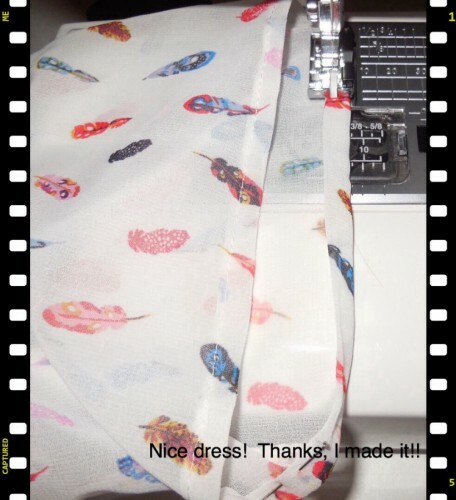 Lovely fabric & pattern – brava for overcoming chiffon’s difficulties! That’s great fabric! I’ve only worked with chiffon once and thought I’d lose what’s left of my mind. The fraying was over the top. The wonder tape idea is genius! It looks so great on you – – lovely and light for Spring. I’m tempted to try again….. Thank you! I never even considered the fraying until I got to the hemming. Then it was too late and it took me a while to proceed again. Putting things down and going back to them is always the charm! Lovely, fresh-looking fabric! Looks really pretty. Great tip on the hem, thank you! Will remember this for future reference. Thank you! The two cats together are quite a sight! Never quiet in this house! I get it! Lots of veins to poke needles in! Haha. Thanks! Linda, you had me worried with all that talk about cats and birds, but I pressed on and ta-da a very pretty top. Nicely done! Thank you! Gotta open with a BANG! Huh? I LOVE this, Linda! And I hate sewing with poly chiffon, but I choose to do it anyway, time and time again, so THANK YOU for the wonder tape tip. Sorry for shouting so much, but I feel very strongly about this adorable top and helpful post. Lovely top and expert sewing on the chiffon! I LOVE that fabric! The blouse looks very cute on you. 🙂 I hate sewing with lightweight fabric like this, so I sympathize with your pain regarding the hem! Thank you! I am glad it all worked out. Just lovely! That feather print is so pretty and so versatile. Your top is beautiful. 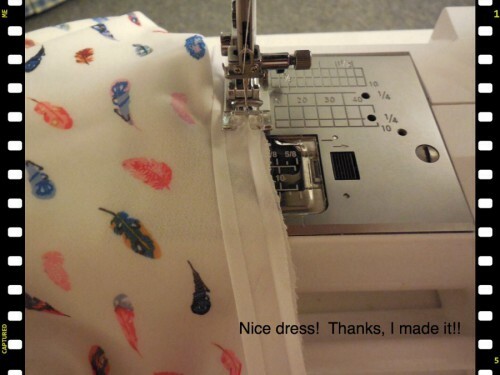 I can’t remember if I ever did work with chiffon when I did sew. I probably saw it fraying on the bolt and took a fast turn in the other direction. Yes, I completely understand that. I wasn’t thinking or I would have run too! It’s very pretty! The fabric looks so lovely and drapey. 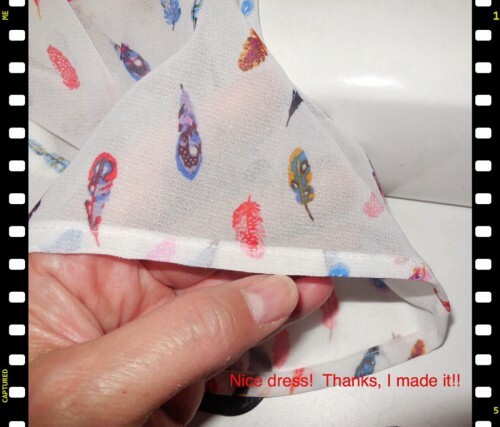 Enjoyed reading how you handled the chiffon and how you attached the lining to the fashion fabric. Gave me some ideas for future garments. Beautiful top! Your top is so fun to wear! I have only sewn with chiffon once and I made something very simple. And I didn’t think it was easy. I think that if I were to sew with chiffon again i will need to have a good few hours so that I can do the cutting and sewing and hemming all in one go. Otherwise, if the fraying and fabric distortion may get to be too cumbersome. Thank you. I found the Wonder tape, or a similar product, completely fixed the fraying.